The train carrying North Korean leader Kim Jong-un back home from his failed summit with U.S. President Donald Trump in Vietnam passed the Chinese border city of Dandong on Monday evening and arrived in Pyongyang after midnight. That was nearly 60 hours after the train left Dong Dang Station in northern Vietnam on Saturday, some six hours faster than the trip there. 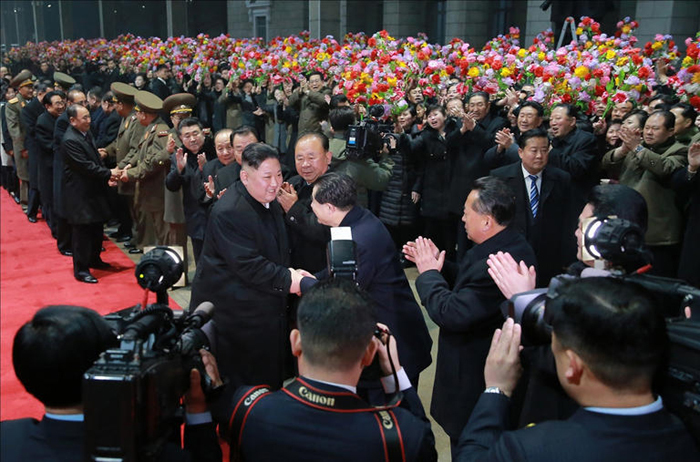 North Korean leader Kim Jong-un is welcomed on return to Pyongyang in this photo published by the Rodong Sinmun on Tuesday. State media hailed the summit as a roaring success. The official Rodong Sinmun daily extolled Kim in an article titled "The world marvels at His Excellency Kim Jong-un's political prowess." Meanwhile, North Korean hackers last week launched attacks on about 100 targets worldwide including Seoul, even before the summit collapsed. Researchers at U.S. cyber security firm McAfee recently detected North Korean hacker attacks on the computer networks of companies in the U.S. The researchers were able to connect to one of the main servers the hackers use with the help of an overseas law enforcement agency, a spokesman said Monday.